"Great Jaguars turn heads in the street. They make people stop and pay attention. They evoke instant desire. That's what the C-XF does and that's what the next generation of Jaguars will do." 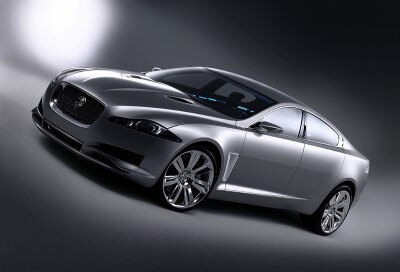 The Jaguar C-XF concept car signals the onset of a new era for Jaguar. A stunning, four-door sports saloon which blends design purity with unmistakable dynamism, the C-XF is a clear indication of the design direction that the next generations of Jaguar saloons will take. And you can expect to see the XF, based on the C-XF concept, late next year. Designed by the same teams that produced the award-winning Jaguar XK sports car range in 2005 - headed by Jaguar Director of Design Ian Callum and Head of Advanced Design Julian Thomson - the C-XF concept is a precursor to cars that will become recognised for their ground-breaking exterior looks and innovative interiors. As a striking interpretation of the design values that are the bedrock of every great Jaguar, the C-XF is wholly contemporary yet succeeds in paying homage to its renowned predecessors. "The C-XF - and the future generations of sports saloons it signals - reaffirms the direction Jaguar is taking," says Bibiana Boerio, Managing Director of Jaguar Cars. "When we launched the new XK sports car series, we talked about a product-led transformation of the company. We promised that new Jaguars would be beautiful, fast, glamorous and evocative. The new XK delivered on that promise and the C-XF proves that these same values and more are coming in Jaguar saloon cars." "One thing should be abundantly clear whenever people are discussing Jaguar design," asserts Director of Design Ian Callum. "Jaguars should be seen as modern cars and in the future people will appreciate them for that." The C-XF is a confident statement of design purity and efficiency. It possesses a sense of latent power that conveys dynamism and movement even when the car is stationary. But the design language of C-XF is about more than just performance and power - it also succeeds in blending many of Jaguar's unique heritage styling cues with bold, contemporary features, signalling how Jaguars will evolve as new generations of sports saloons go into production. "Throughout its history Jaguar has created some of the most striking, modern and beautiful sports saloons imaginable and our objective with C-XF was to recognise those principle design disciplines," explains Ian Callum. "The values that I see in Jaguar aesthetics include purity, dynamism, latent power, balance and modernity." Those Jaguar values are instantly recognisable in earlier iconic models. Founder Sir William Lyons demanded the same aesthetic correctness and every one of his legendary designs proved his skill in designing some of the most attractive cars of all time. The C-XF's design team took inspiration from some of Lyons' greatest cars, including the 1950 Mark VII and 1959 Mark 2 saloons. Their attractive flowing lines were influenced by some of the great sporting Jaguars of the era including the XK120 and both display that extraordinary feeling of latent power that so signifies a Jaguar. Ensuring that C-XF, while still a saloon, possessed the sporting profile expected of every Jaguar required maximum design efficiency - the whole exterior 'skin' had to be as tight as possible to the body architecture. This focussed the Jaguar design team on designing a car that Ian Callum describes as "the absolute definition of athleticism", a performance-oriented sports saloon that is still inherently practical and capable of carrying four people in total comfort. C-XF has a taut beauty, but it is also a car that will challenge people's preconceptions about Jaguar; it has an edginess that exudes a sense of underlying menace. "Jaguars should be perceived as cool cars," says Ian Callum, "and cool cars attract interesting, edgy people. The next generations of Jaguars will do just that." Set into the front of the C-XF is a bold and aggressive grille finished in black chrome. Recessed deeply into the body rather than sitting flush with the surface, the visual effect is similar to that of an air intake on a jet engine and serves as a reminder that directly behind is a sophisticated and powerful 4.2-litre supercharged V8 engine. "Jaguars need a distinctive grille, a face," says Ian Callum. "It's the classic 'car in the rear-view mirror' look, with everything powering rearwards from the grille. The C-XF is a perfect example of how to execute this successfully." The headlamps which evolve the twin-lamp motif seen on previous Jaguars into a single slim wedge, are narrow and angular. They bring an air of aggression to the C-XF's profile, while between the lamps a blue streak of light reveals an almost cat-like iris when illuminated. Subtly etched below the lenses is a unique 'tattoo' design showing an abstract Jaguar leaper logo - a tattoo that is repeated in the treadplates of the door sills and in the tread of the bespoke Pirelli tyres that surround the 21-inch machined, polished aluminium wheels. Running backwards from the nose of the C-XF is the main feature line of the car - an unbroken shoulder that flows beneath the cabin glassline and into the haunch over the rear wheel. It is this feature, a modern interpretation of renowned Jaguar sports saloons from history, that endows C-XF with its latent power. A similarly simple line can also be seen on the new XK range and is one of the design cues that will carry forward onto the next generation of Jaguars. Above the shoulder line sits a low and sporting cabin with aluminium brightwork highlighting the coupe feel of the car. Further sporting lines are accentuated by the muscular bonnet and the side power vents that have a functional white ceramic finish. At the rear of the C-XF a very sculptured shoulder flows from the C-pillar into a tight, aggressively tapered tail that clearly displays traditional Jaguar design cues yet succeeds in striking an incredibly modern feel. When seen from behind, C-XF is noticeably wide and powerful, a look accentuated by the large rear diffuser. The basic principle of diffuser technology sees air being drawn from beneath the car to force a low pressure area that improves cornering grip at higher speeds. The C-XF's colour palette is deliberately monochromatic, mixing a one-off exterior paint - Metashine silver - with areas of brightwork in either chrome or aluminium finishes. Additionally, white ceramic is used to indicate areas of dynamic air flow or heat exchange - in this case the side power vents and tailpipes. "The colour choice for the C-XF was very deliberate and is a key part of its overall dynamic," says Head of Advanced Design, Julian Thomson. "We describe the effect as 'tone on tone' - we want people to think about the materials, the textures and how they interact with the functions of the car." Thomson continues: "The tonality has a functional aspect but also extreme beauty; mechanical designs that are fit for purpose are often beautifully designed - we've taken our inspiration from machinery as diverse as aircraft to cameras in seeking to make the car look like it was milled from a solid piece of metal." Design Director Ian Callum describes the cabin of the C-XF concept car as "one of the most exciting interiors Jaguar has ever done". One glimpse of the inside of the four-seater is enough to understand why Callum has this view. The emphasis is on tailored performance rather than pampered luxury and nowhere is that better demonstrated than in the lightweight, sculpted bucket-style front seats. Trimmed in semi-aniline leather (a specially dyed hide which ensures even colouration yet retains its softness) the seats are sports-styled yet also offer impressive comfort thanks to a deeply padded lumbar area with ventilation cavities. Twin individual bucket seats house the rear-seat passengers. Between the seats runs a tall central transmission tunnel that gives the occupants a sense of sitting deep within a futuristic cockpit. One of the keys to any Jaguar interior is that occupants should feel as if they are enclosed in the car, not sitting on it. The C-XF's interior cossets in just such a way, providing an inviting cabin for passengers to slip into, rather than surrounding them with open space. The 'tone on tone' theme that has been applied to the exterior of the C-XF has been carried through to its interior, with a sensational blend of materials, graphic elements and innovative technologies. The focal point of the interior is a sweeping brushed aluminium facia that wraps around the cabin in a dynamic linear graphic that instils a sense of velocity. The counterpoint to the aluminium is a combination of leather and wood that takes detail of finish to a new level. What at first sight may seem to be a simple black interior is actually a sophisticated and contemporary blend of materials including a unique carbon fibre pattern leather and luxurious semi-aniline leather. Areas of the doors and transmission tunnel have been carved from Poplar wood and then scorched to obtain a rich satin feel. This finish was perfected by artist Clive Sheridan, who produced these burnt wood forms. "These unusual finishes allow us to explore new ideas and themes," says Alister Whelan, one of the designers responsible for the C-XF's interior. "Jaguar is recognised for tailoring cars in wood and leather, but we have turned that on its head by treating these traditional materials in an unusual and contemporary fashion, obtaining beautiful textures and grains." Whelan continues: "And by using non-grain leather on the seats, it looks like they are moulded from neoprene. It was a deliberate choice not to put any stitching on them - in fact, there is no visible stitching on the interior at all, it just appears to be entirely wrapped in leather." Jaguar's ethos on embracing new technologies that enhance the driver experience has long been that they should surprise, delight and inform, rather than impose themselves or bombard the user with excessive information or choice. "C-XF is a showcase for innovative technology, some of which will feature in one way or another on the next generation of Jaguar cars," says Ian Callum. "Every Jaguar interior should have a sense of fun, but we also recognise that technology should only be there when you want to use it. Yes, there is a sense of theatre about the innovations we have chosen to highlight on the C-XF, but there is also an organised simplicity that brings order and structure to every system." Perhaps the most theatrical of the features Callum references is the starting sequence. Sink into the C-XF driver's seat and a jewel-like Power button pulses on the centre console - its rhythm representing the 'heartbeat' of the car. Press the button and beneath your hand concentric aluminium rings spiral downwards to allow the new circular JaguarDrive Selector to nestle directly in your palm. Then, as the engine starts, a beam of blue light radiates from the centre of the instrument panel, chases its way around the cabin and finally envelopes the rear seats. Overhead, an electro-luminescent panel spanning the entire rooflining bathes the interior in a muted blue light to give a feeling of ambience and space. Outside, a burst of blue light from the front grille marks the moment the car's engine fires into life. "We want Jaguars to feel like they are coming alive when you start them," says Interior Designer Alister Whelan. "The starting sequence achieves this through the combination of movement and light, creating a sense of theatre and delight. It is a development of the ambient illumination we introduced on the R-D6 concept car and the best example yet of how you can create a mood within a car." Visually coming to life when being started is one thing, but sensing the requirements of an occupant without physical touch is a further, significant leap forward again. The introduction of a new prototype technology, called JaguarSense, sees four sensors hidden within the doors react to the sweep of your hand as it passes over them. Once activated, the inner door handles - previously hidden - motor outwards ready to be used. A fifth sensor, located in the facia, responds to the proximity of your hand to reveal an infotainment screen that lies flush within the aluminium front panel. The sequence continues with the centre section of the dashboard rotating 90 degrees to display an advanced Dual View screen which is capable of projecting two different images to the driver and passenger simultaneously. For example, the driver can view satellite-navigation instructions while the passenger watches a DVD-based movie. The Dual View system works by utilising a parallax barrier to divide light into individual viewing cones for the passenger and driver, allowing each front-seat occupant to view their own personalised display. The Dual View system, which has been developed for Jaguar by mobile media specialists Alpine, uses a 262,144 colour amorphous silicon TFT screen. Also contained within the rotating panel are air vents that, like the screen, are hidden from view until the driver requires them. This is in complete harmony with the overall sophistication of the driver environment. Behind the single-spoke steering wheel with 'floating' gear-selector paddles sits a dial cluster that has been inspired by the cockpit of an airplane. The main central dial - the rev counter - has graphics reminiscent of an artificial horizon instrument from an aircraft. The dials also respond to the way C-XF is being driven. If the driver puts the transmission into sporting Dynamic mode, the rev counter motors outwards (in the way a long lens on an SLR camera operates), ensuring its increased prominence. Driving C-XF in a more relaxed manner would allow occupants to enjoy an audio experience of the highest quality. Visually stunning honeycomb speaker panels are set into the rear parcel shelf and front facia top. Designed by Jaguar and created by leading British loudspeaker manufacturer Bowers & Wilkins, the beautiful cat's eye-shaped designs are aesthetic yet functional works of art. "Bowers & Wilkins is renowned for its audio engineering expertise," says Julian Thomson, Head of Advanced Design, "Its dedicated pursuit of the perfect loudspeaker has led to many design innovations, including the use of materials such as Kevlar and diamond. It is no surprise that B&W speakers serve as the 'audio reference' speaker at London's famous Abbey Road Studios. "The speaker panels provide a perfect aesthetic while serving a unique function. The honeycomb Micro-Matrix ensures rigid mounting and at the same time improved speaker performance. They are beautifully crafted pieces of engineering." All of these features are prime examples of how the introduction of new technologies can be implemented by blending simplicity of design with practical innovation - and more importantly they give an early preview of what lies ahead for Jaguar customers. Beneath the C-XF's bonnet, further technical excellence is immediately apparent. The car is powered by an enhanced version of Jaguar's 4.2-litre supercharged V8 engine. Tuned to produce in excess of 420 bhp and 500 Nm of torque - the latter produced from very low revs - this proven powerplant and its six-speed automatic transmission with Jaguar Sequential Shift manual gearchange capability, deliver superb sporting performance. And the technology advances continue here, too, with the electrical architecture for the 4.2-litre engine encased in a unique carbon-fibre wiring 'loom'. Designed and constructed by Beru F1 Systems, the electrical 'spider' harness is extremely functional. "The new wiring loom is a designer's dream," says Julian Thomson. "We thought we would always have to live with the plethora of wires that runs around an engine bay. Now every wire is housed within a visually stunning harness that looks as if it is literally strapping the engine down, holding all that power in place." The C-XF is the first car ever to use Beru F1 System's unique Wire in Composite (WIC) technology. WIC completely encloses all wiring in a bespoke carbon-fibre sleeve, protecting it from damage and also improving durability, packaging, weight and aesthetics. As the first vehicle to use the technology, the C-XF leaps ahead of upcoming debuts in both Formula 1 motor racing and the aerospace industry - and allows Jaguar to further investigate production car potential for the system. The C-XF is not just another concept car - it is much more than that. The exterior design is pure, athletic and, of course, attractive. The striking interior design uses traditional materials, but fashioned in new and contemporary ways. The four-seat cabin - sufficiently spacious but not a bland, featureless expanse - is a welcoming, rewarding place to be. The technologies and innovations are typical of the features on a Jaguar - and preview others that are still under development. The powertrain - a supercharged V8 of proven excellence and a sophisticated six-speed automatic that delivers lightning-quick manual gearchanges thanks to the Jaguar Sequential Shift System - is perfectly suited to a true sports saloon. The sum of the C-XF parts is impressive enough, but the whole - an exciting, modern, dynamic sports saloon that evokes absolute desire - is an extraordinary preview of the Jaguars of tomorrow. "The Jaguar C-XF concept is the most dynamic and modern four-door car that Jaguar has ever created, a design showcase heralding the next generations of our sports saloon models. It signals a future for Jaguar that is as exciting as the C-XF itself." Ian Callum, Design Director, Jaguar Cars. The production model to be based on the C-XF concept will be known as XF. A European release of this new model, which will replace the S-TYPE, is expected in mid-2008. An Australian release is anticipated in late-2008.